Voice: Today is the first Sunday of Advent, the Sunday in which we recall the hope we have in Christ. Voice: The prophets of Israel all spoke of the coming of Christ, of how a savior would be born, a king in the line of David. They spoke of how He would rule the world wisely and bless all nations. Voice: On Christmas day the Christ of our hope was born. On Good Friday the Christ of our hope died. On Easter day the Christ of our hope rose from the dead. He then ascended into heaven. On the last day, the Christ of our hope will come again to establish His realm over all things on earth. Voice: As the followers of Christ, we await His return. We light this candle to remember that as He came to us as humbly in the manger at Bethlehem and gave light to the world, so is He coming again in power to deliver His people. 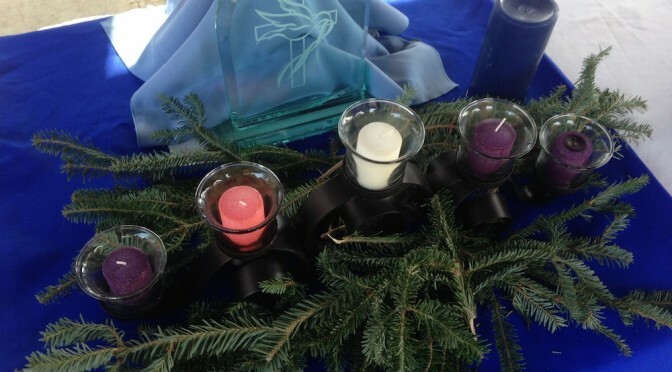 Voice: We light this candle to remind us to be alert and to watch for His return. Voice: Let us pray. Loving God, we thank you for the hope you give us. Help us prepare our hearts for the Lord’s coming. Bless our worship. Help us live holy and righteous lives. We ask it in the name of the One born in Bethlehem. Amen.